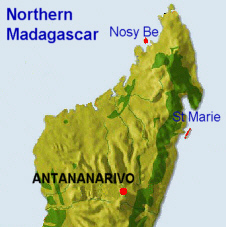 Since Madagascar gained Independence from the French in 1962 various socialist governments have deterred tourists from visiting the worlds 4th largest island, leaving much of the island's coral reefs untouched. Virgin reefs are still to be explored. Today, Scuba Diving in Madagascar is in the infancy of the tourist industry and therefore still not overly commercialised, making it a very welcoming & exciting destination to visit. Popular dive spots include "Muriel's Garden" & Charlie's Point"
A Madagascar vacation lends itself to more than just a beach holiday. As the world's fourth biggest island there is much to explore and be seen on this Mystical Island of Madagascar. To appreciate the full diversity of the Madagascar wildlife, culture, amazing plant life and unusual Tsingy rock formations you need to travel through the forests, through villages and across the countryside, finally enjoying 5 days of relaxation on the beaches of Nosy Be Island. This adventure holiday tour takes us to the northernmost tip of Madagascar, Diego Suarez & then south west to Nosy Be Island. Diego is situated on the shores of the second largest natural bay in the world and a strategic safe deep water harbour to shipping with dry docks and other shipping services. Due to its logistical value it saw conflict in both the World Wars as can be witnessed from the artillery gun emplacements at the entrance to the bay, still visible today. You fly into Antananarivo the capital of Madagascar from Johannesburg. Depending on flights, transfer to domestic departures for a 90 minute flight to Nosy Be Airport. You are met and transferred to Chanty Beach where a boat transfers you to the smaller island of Nosy Sakatia approx one mile across the channel. Your host, Jose, is an ex South African with many hours of diving under his weight belt to share with you. It is left to you to discuss with your host the dives you wish to enjoy and when you wish to dive the various sites available. Returning to Tana to connect with you flight to Johannesburg. Sakatia Lodge is situated on the south east side of Nosy Sakatia in a protected bay at the base of a tropical sacred mountain, the lodge has a sea facing lounge, fully licensed bar, restaurant and caters only to a maximum of 20 guests in bungalows with a specialised Dive centre, so you are assured of individual attention and no overcrowded dive trips. The numerous dive sites around Sakatia vary in depth from six to fifty meters, consisting of walls, drops, coral reefs, and pinnacles. During boat rides, encounters with dolphins and whales are not uncommon, and dives with manta rays and whale sharks are all in a good days diving. The three house reefs five minutes away from the centre not only offer great afternoon dives but also are ideal spots for extremely safe night dives. The small paradise island is a place where dreams are made - no roads only foot paths. The above package is Ex Johannesburg but if you flying from your home country directly into Madagascar, contact Selftours for a reduced rate on flights. - International flights Ex Johannesburg direct to Nosy Be return. - Airport Taxes : per person.